Don’t look now, but the Kansas Jayhawks are back in the Top 10 and threatening to snag yet another No. 1 overall seed in the NCAA Tournament this month. Head coach Bill Self and his Jayhawks sit atop the Big 12 standings after a dramatic come-from-behind victory over Iowa State, and seem to have righted the ship after an uncharacteristic three-game losing streak in early February. Kansas is the most consistent college basketball superpower of the last decade. The Jayhawks have won or shared the Big 12 conference title for eight consecutive seasons, and won the national championship in 2008 with a thrilling victory over Derrick Rose and Memphis. In fact, since 2004, the Jayhawks have ranked no lower than the fourth seed in the NCAA Tournament. Self has compiled a 292-57 record in his 10 years in Lawrence, an incredibly impressive mark, especially considering that so many of his players have left school early to enter the NBA Draft in recent seasons. KU is poised to go far in the tournament again this year. Ben McLemore is having a freshman campaign for the ages, leading the Jayhawks in scoring with 15.9 points per game. One of the top ranked NBA prospects in the country, McLemore has proven to be a deadly shooter, particularly from three-point range, as he is knocking down 42.3 percent of his shots from long distance. While McLemore is Kansas’ go-to scorer on offense, the defense relies heavily on the presence of senior center Jeff Withey. The seven-footer from San Diego is one of the best shot blockers in the country, and earlier this year broke the conference’s career blocked shots record of 265. 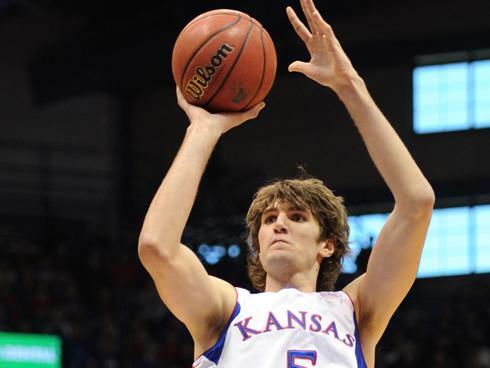 However, Withey is more than just a defensive presence for the Jayhawks, as he also averages 13.5 points and 8.5 rebounds per game. Seniors Travis Releford and Elijah Johnson also average double-digits in scoring for Kansas, giving KU a very balanced lineup. With both the Big 12 and NCAA Tournaments fast approaching, the Jayhawks appear to be trending upward again at just the right time, and it would not be a surprise to see Kansas cutting down the nets in the Georgia Dome this April. This entry was posted in college basketball and tagged college basketball, kansas basketball, march madness, ncaa tournament, prominent tickets by promc58blog. Bookmark the permalink.